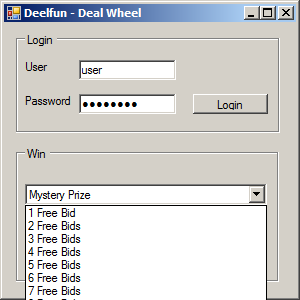 There was once a website called DealFun. It was a so called "penny auction", It charges customers 60 cents per bid. The item being auctioned starts at zero dollars and every time somebody bids on it, it goes up a penny. Auctions usually had a start time of 24hrs. Within the last few seconds of the auction people really start to bid, every bid placed resets the auction time to 15 seconds. So a $300 item might go for $200, but getting the price up that high requires 20,000, sixty cent bids, or $12000 worth of bids! So there were many people paying for the items, but only one person actually got it. In order to incentivise people to use their website, they had various promotions, such as 100 free bids with the purchase of 250 bids. They also implemented something called the Deal Wheel. Which is something like the Wheel of Fortune, so every time the user spun the wheel, they would win a prize. They would win 1-10 free bids or a mystery prize. Spins were limited to once per day. Bids were almost worthless because of the difficulty of actually winning an auction. Mystery prizes were actually physical prizes though. So I decided to write a program that would win a mystery every spin. I am currently in school in hopes of becoming an electrical engineer. I would love to help invent the next iPhone or 3D-television. I love to take things apart and find out how they work, how they can be modified or repaired. Nothing really excites me more than a good challenge. I spend much of my spare time developing random projects, which I hope to share on my blog.